Most business plans products presently available in the market place do not explain how to generate a customized business plan. They simply use fill-in-the blank formats that frequently do not fit specific businesses. Do you need to know more about how to manage your business? Are you too busy running the business to take lengthy college courses? Are you unable to find time to read books on complex business topics? Can you not afford the cost of formal business training? The BizBite Business Plan will help you create a business plan that works for your business. The success or failure of your business will depend on the hiring decisions you make. Have you experienced a high turnover rate of employees? Is it hard to source people that bring to the job the skills, experience, and judgement your business needs to compete? Do you have difficulty-finding employees with the right attitude? Would you like to learn ways to motivate your employees to increase their drive, initiative, and productivity? The success or failure of your business depends on the sales of your products or services. Sales & Marketing Management is about implementing your marketing strategy. Analyze your business and the market it serves? Train, motivate, and direct your sales staff? The success or failure of your business will depend on how well the money invested in the business is managed. Financial Management is about maximizing the Return On Investment (ROI) of the invested capital. Ensure that all operating costs are recovered? Build profit into all aspects of the management of your business? Identify trouble areas in your business and take early corrective action? You will learn how to apply sound principles of financial management and you will be able to ask better questions of your accountant. 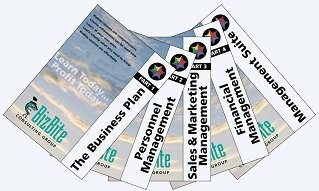 Click on Management Suite Sampler to see what you will learn. These workbooks present all of the business testing formulae, spreadsheets, and examples of financial statements that are included in The Business Plan and Financial Management products. After learning the business ideas and methods in these products you can then go to the Interactive Excel Workbooks, put in figures from your own business and see the calculation done for you and the result as it applies to your business. The workbooks are password protected to insure that macros are not accidentally removed. It is recommended that the user not work with the original copy, but rather should copy the Excel file before working with it. The workbooks are a great tool help you monitor and analyze the financial health of your business and make good business decisions.